6 minutes to the Makarska's main beach by walk! 12 minutes to the old part of town and the main square by walk! The villa lends itself perfectly to the enjoyment of both, the indoors and the outdoors of Makarska's mediterranean. We are hoping the offer will fulfill some of the demand which exceeds Makarska's current state. The wide living space, indoor and outdoor dining areas, chic bedrooms and gorgeous deck space have all been designed to give unabated views that are just a stone's throw. A luxurious private pool and outdoor lounge chairs allow you to enjoy and relax in the unending sights and sounds of Makarska. The villa has an indoor area of 350m2 across three floors. 4 bedrooms and 5 bathrooms for up to 8 people. On the ground floor you have your own secure garage inside the house. And also a few parking spots in front of the house. The first floor consists of a bedroom with a bathroom, a kitchen with a spaceous living room from which you have access to a big terrace with the private pool, shower and barbecue. The second floor has two bedrooms, one "master" bedroom(60m2) with a bathroom(bathtub and shower) and a second bedroom, containing a bathroom with a shower. 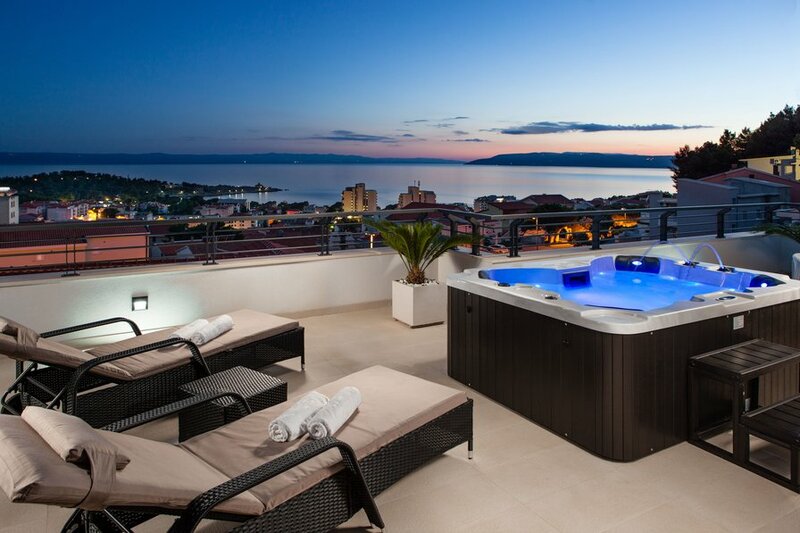 The penthouse floor offers you a king size bed and the terrace from which you have a panoramic view of the city of Makarska, the islands and the mountain. For 2016 season ***** jacuzzi on the penthouse terrace with view on the seaside of the villa.